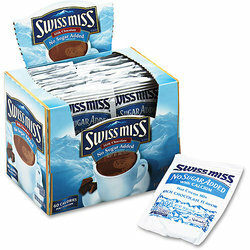 Swiss Miss No Sugar Added Hot Chocolate is simply fantastic. We really like the fact that we can offer such a great tasting product in a no sugar added product. Comes in a 24 count box suitable for display and distribution. Makes a great "Mocha Coffee"!